Use your connections to win the throne with intrigue or force. 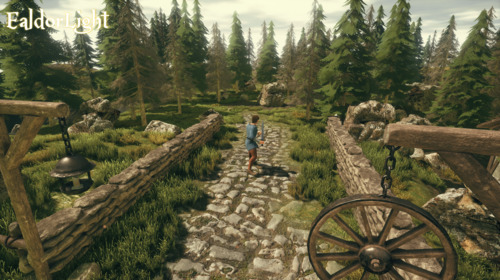 RPG with realistic damage & procedural storytelling for PC, Mac & Linux. Ealdorlight is a single player RPG set in a medieval kingdom where magic is rare and mysterious. You discover at the beginning of the game that you were found lost as a small child, and the identity of your real family is unknown. Soon after, you meet the Ealdorlight, a legendary supernatural being not seen for centuries, who tells of darkness in the kingdom and invites you to take the King's place. You must leave your adopted home and travel the land, gaining connections, title and influence in order to discover your real family, and to win the throne: through honour, intrigue, or force. The game has turn-based combat with a realistic damage system that models bones, muscles and organs. It also procedurally generates an new kingdom history, society and people every game. Each time you play you'll meet different characters with different backstories. 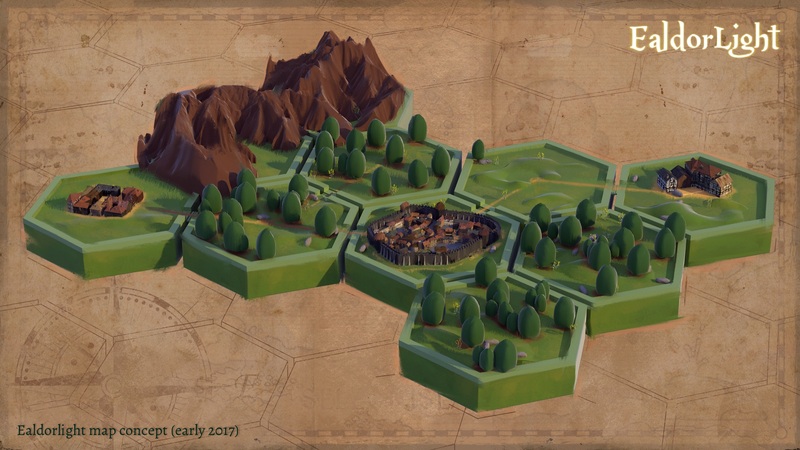 Each new game of Ealdorlight creates a randomised hex-grid world and generates several hundred years of a kingdom’s history and people. There is a fixed starting point in which the great legends and characters of the past lived and died. The most recent few centuries are randomly generated every new game, ensuring that every character you meet has a different story and family. Before the start of the game, rulers rise and fall, settlements are founded and spread, and are attacked or abandoned. Roads are built, crops are planted and wars are fought. Peasants, nobles, heroes and villains are born, live and die, creating legends and leaving ancient weapons and armour behind for you to find. This generation leaves you starting the game with a whole kingdom of characters and relationships to explore and exploit. Your character, and every person you meet has an entire lineage and family tree - from a mighty duke to a lowly farmer and everyone in between. It’s now been over three months since the end of the Ealdorlight Kickstarter campaign. I’ve deliberately been taking some time to think and learn from the fact that it didn’t reach the target, and to work out what to do next. Frankly, I was pretty upset that the campaign didn’t make it, and it’s taken a while to get over it. Sol Trader was barely six months out before I powered into a new title. I didn’t give the design enough thought before going public with it. If I’m honest, there were some big design holes in the pitch. I still believe that I can close those holes, but I was asking people to trust me to create a great RPG without much proof I can do that yet. The days of blind trust on Kickstarter are long behind us, and I should have closed those holes ahead of time and provided more evidence. Ealdorlight promised an expansive procedural role playing experience in UE4. Doing this well requires a fair sized team with different talents: although I managed to pull together some great people, I didn’t have the cash to polish the prototype as much as I wanted. The screenshots and demo I rushed together just wasn’t ready for the gamers to see yet. I was asking for cash to make it prettier, but my demo wasn’t good enough for an 3D RPG to stand out on Kickstarter in the first place. There are a very established set of expectations for a modern 3D RPG. If youre doing something different, then you need to clearly demonstrate how your game transcends established norms. This is hard enough with a clear design and a demo showing key principles. I found it impossible to do this at the stage of project I was at. 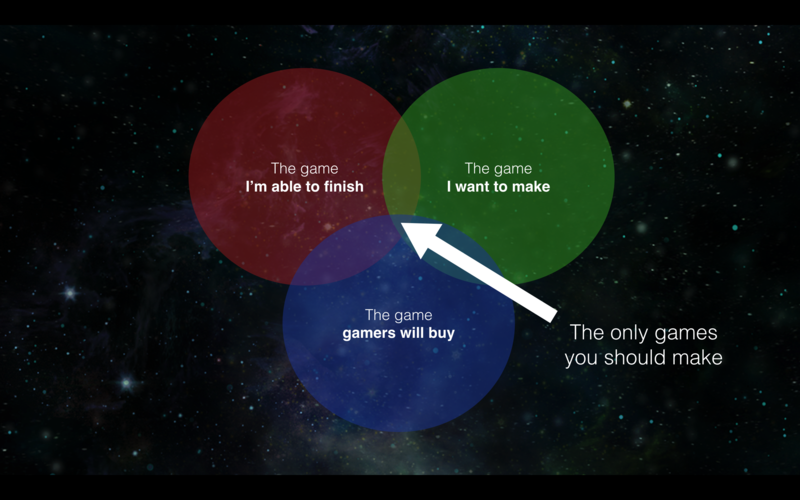 In his seminal article Ryan Clark talks about making the game that’s at the intersection of at least three things: The game you want to make, the game you can make, and the game people want to buy. I wanted to make Ealdorlight, I think people would have bought it, but I fell down on the “game you can make” category: I just don’t have the in-house team or the cash get enough of a prototype together for Kickstarter to get the idea, and I can’t self fund a game of this size. I’ve talked to a few publishers, and whilst there’s some interest, I’m putting Ealdorlight on indefinite hold. As I’ve thought more about the design, there are some big inherent risks, combined with the very established set of gamer preconceptions about the genre (especially in a 3D title) mean that it’s too risky as a second title after Sol Trader. Ealdorlight was an expensive prototype for me to make, and practically I don’t have the cash to embark on another full time project. My next game project will need to be of a more manageable scope, which means my next game cannot be Ealdorlight. I’m currently working hard to pay off debt accrued during the previous games endeavours, which is taking up most of the capacity I have for work right now. Besides working hard to In the meantime I’ve been working more on Sol Trader here and there. Since revisiting it again after working on Ealdorlight, I was struck again at how good the core of the game is, and how a little extra work can make it even better. I’ve been improving some of the UI around notifications, and adding in a new ship type to play with. More information will be shared very soon. I’ve also been thinking hard about what I actually want to do in the games industry. What types of games do I really want to make? How do I want to go about making them? These ideas are much more significant that simply the next game title, and I’ve become more and more excited about them as they’ve taken shape. I’ve reached the stage where I’m starting to reach out for feedback from trusted friends and other developers in the industry. More when I’m ready to go public. Thanks for all the support, messages and pledges I received around Ealdorlight - I’m very grateful! I’ll share more details about what’s next soon. 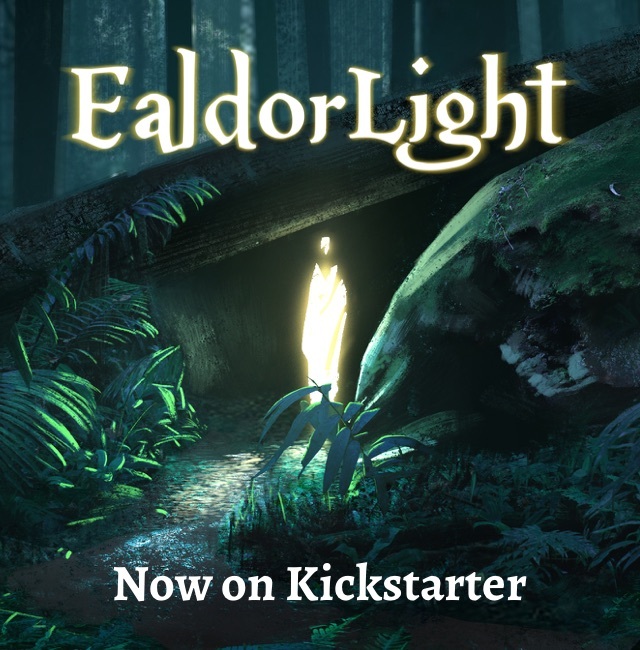 TL;DR: Ealdorlight's Kickstarter campaign is live at 4pm today! Go and back it! The sixth of June is a significant day for me personally. In 2004, I spent the entire of the day in hospital. I remember the 60th anniversary commemorations of D-day on the TV in the background, as I sat beside my wife, in labour with our first child. I became a father an hour after midnight on the 7th June; my son becomes a teenager tomorrow. Twelve years later, in 2016, I spent the entire of 6th June glued to Steam watching and waiting whilst my first game Sol Trader was released to the world. This was a career dream come true: since I started programming at six years old I’d always wanted to create and ship my own games. Sol Trader’s release was ultimately a painfully formative experience for me, which I wrote about at the time and was interviewed about recently in GamesIndustry.biz. Over the last year, I’ve been keeping busy doing two things. One is to support Sol Trader as much as I can with countless updates and patches. I’ve also been very busy working on a new game, Ealdorlight, a medieval RPG-style take on Sol Trader’s mechanics, with turn-based combat, realistic damage and great graphics. I announced Ealdorlight in March and demonstrated it at Rezzed, strengthening my hope that the idea was a good one. I decided fairly early on that I wanted to take Ealdorlight to Kickstarter. Sol Trader’s successful Kickstarter was a brilliant experience. The Kickstarter community is one of the kindest, most positive on the Internet. I also needed funding for this game: Sol Trader was self-funded through many long evenings and contracting work, and for Ealdorlight I need a bigger team to realise the vision. It’s built in Unreal Engine 4, which simultaneously saves me loads of development time and means I need a bigger team to pull off the realistic art style I’ve gone for. As time came near to launch, the first anniversary of Sol Trader’s released seemed an appropriate day to launch the campaign. So today, 6th June 2017, I will spend the entire day glued to Kickstarter as my campaign goes live at 4pm today. There’s plenty more about Ealdorlight on the campaign - head over there and read all about it! A huge amount of work has gone into it, and I’m very grateful for all the support and help I’ve received from the team I’ve put together, and for friends and family who have given me endless encouragements and feedback. This post is a little earlier than 4pm so that you can watch it go live if you want. Earlier backers get lower edition numberings on some of the rewards, so you might want to be there from the start! As we head towards the Kickstarter campaign launch on June 6th, I want to talk a little about the story behind Ealdorlight works. 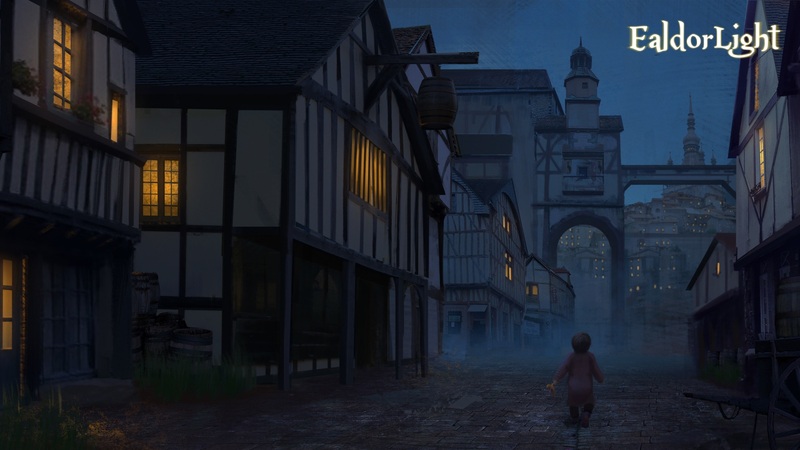 The basic story stays the same for each game: you are discovered wandering through a remote village at a young age, and realise your destiny is to overthrow the King. However, like in Sol Trader, every person you meet is randomly generated. This means that your real identity will be different every time, and you’ll have to discover it all over again every time you generate a new game. The trick is layering a great story on top of a generated world with random characters. Building empathy with the main character and his family when all characters are generated is hard, and hinges around being able to hook the story in at the right moments. My plan is to write plenty of tightly connected story arcs that are triggered on events that happen during history generation. These will in turn trigger future quests the player can undertake. Not all story-arcs will appear in every game: it will depend on how the history generation goes. I will constrain things such that there is always a route through the game, and that players always have a way to overthrow the King, even if that might be easier or harder depending on the starting setup. These story-arcs then should interact with each other, hopefully producing a unique path through the game. Ealdorlight is set within a low fantasy world, and there’s no traditional magic. 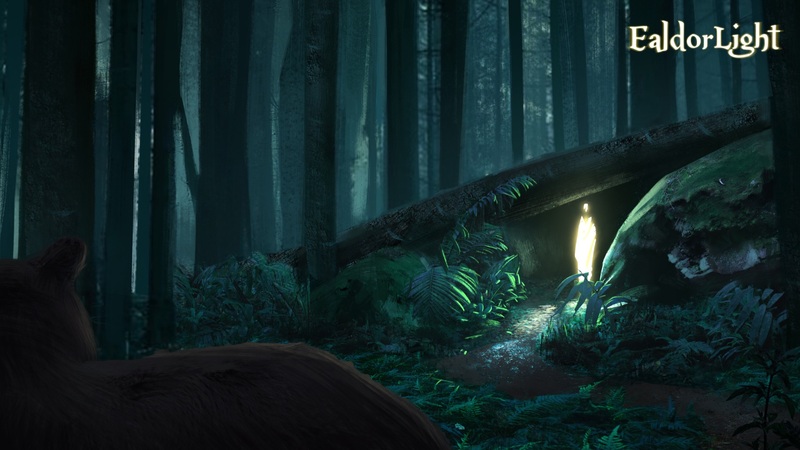 The player gets more powerful through discovering key pieces of knowledge about their past. These insights into of your real past feed directly into your character’s stats, skills and abilities. I’ve long been fascinated with identity: knowledge of who we truly are affects many areas of our lives for the better. In Ealdorlight I wanted to tell a story which takes this to an almost supernatural level. By removing the player from their birth family, they start as an entirely normal person within the world. It’s only after their early game encounter with the Ealdorlight and the discovery of their past that things begin to change. Much more on this to come, but in the meantime, here’s a glimpse of our story’s beginning. Ealdorlight is a single player RPG set in a low fantasy kingdom where you must influence, cajole and fight your way to the throne. Players travel the land, meet characters, perform quests and attempt to discover their true identity, different every game. Learning about the pasts of other characters gives the player influence over them, and learning who they truly are allows a player’s character to become more and more powerful. Along the way they will discover ancient weapons with hidden pasts, recruit allies, fight those who get in their way, and finally build a strategy to overthrow the King. 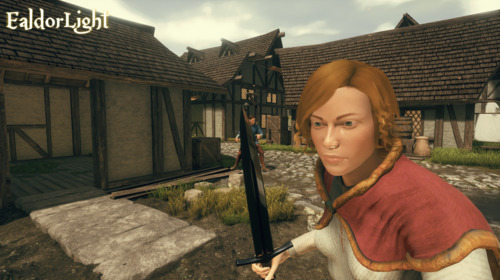 Ealdorlight generates centuries of history and society each game, giving players a whole kingdom of characters and relationships to explore and exploit, with turn based story-focused combat and an open quest structure. Find out more info on the website! The plan is to put the game back on Kickstarter in May. Kickstarter was awesome last time for Sol Trader’s campaign - I think that the Kickstarter community is one of the best on the Internet for encouragement and positivity. I also want to check in with gamers to make sure the game I’m planning is the one people want me to make. I’m building this game in Unreal, although parts of Sol Trader’s engine will make it into the game. Using Unreal has been a great experience so far. I’ll post tips and other learnings here as I go, as well as some thoughts on why I chose it. I’ve already had some very helpful feedback on the idea and am looking for more - what thing about Ealdorlight most draws your attention? Ealdorlight is © 2011-2019 Think Code Learn Ltd trading as Revelation Games. All rights reserved except those of their respective authors.